A car bomb has killed at least six people and injured about 70 in the north-western Pakistani city of Peshawar, police say. 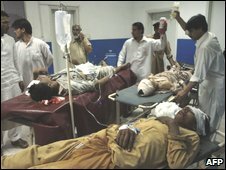 The explosion happened outside a cinema in a busy marketplace, senior police official Abdul Ghafoor Afridi said. 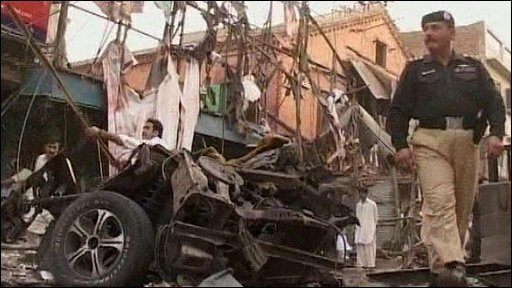 Buildings were severely damaged, and cars destroyed in the blast. The attack came on the day the UN appealed for $543m in aid to help more than 1.6 million people displaced by fighting in north-west Pakistan. No group has said it carried out the Peshawar attack. The cinema, Tasvir Mahal, is located in a densely populated area and the street is usually crowded. Its facade was severely damaged. The blast happened while a film was being shown, but it was unclear if members of the audience were injured. Surrounding restaurants and shops were also damaged. Residents said the blast was very loud and heard in many parts of Peshawar, AFP news agency reported. A similar blast six days ago outside an internet cafe in Peshawar killed 11 people. The capital of North-West Frontier Province, Peshawar has become the front line city in the so-called "war on terror" in Pakistan. Bombings and suicide attacks coupled with kidnap for ransom have become commonplace. Pakistan's army began an offensive on 2 May against the Taliban after a peace deal broke down and militants began expanding their area of influence. Martin Mogwanja, acting UN humanitarian coordinator, said: "The scale of this displacement is extraordinary in terms of size and speed and has caused incredible suffering.